In the first blog post of 2015, I explored the origins of and various customs and conventions surrounding the Christmas and New Year’s addresses by European heads of state. This year, I will look more closely at the content of these speeches (although focussing – for the sake of brevity – only on presidents, i.e. non-hereditary heads of state this time). As I noted in my post last year, Christmas and New Year’s addresses rarely rarely belong to the most important political speeches in European democracies and often include a short summary of the last year’s events in the country. Common themes (apart from holiday wishes) are relatively rare. This year, however, many presidents directly addressed the refugee crisis in Europe. The presidents of Austria and Germany who have had to deal with extraordinary refugee streams both called for compassion and tried to strengthen the ‘can do’-spirit that has so far characterised the reactions of Federal Chancellors’ Merkel and Faynmann and volunteers in both countries. Presidents of other countries hit by the surge of refugees did not address the issue so clearly. Hungarian president Ader referred to it among other unexpected events of 2015, while the Slovenian and Croatian presidents Pahor and Grabar-Kitarović in their – significantly shorter seasons’ greetings – did not raise the issue at all apart from vague references to difficulties. The refugee crisis featured more prominently on the other hand in the speeches of Slovak president Kiska and Czech president Zeman – yet taking almost diametrically opposed positions. Kiska largely downplayed the issue stating Slovakia was much less affected than other countries and the issue should not dominate the national agenda. Zeman on the other hand, called the influx of refugees as “an organized invasion” and called for young male refugees to return to their country to fight ISIS. Given Zeman’s previous statements this is hardly surprising, yet it is generally unusual for a Christmas message to include such controversial material. The refugee crisis also took centre stage in speeches by Finnish president Niinistö as he justified the steps taken by the government to limit the number of people receiving help. Another theme in presidential speeches were national tragedies and the security. The Paris attacks featured strongly in French president Hollande’s speech, so did the Germanwing air crash in German president Gauck’s Christmas message. The ongoing Ukrainian crisis and potential conflict with Russia as well as the war in Syria were included in a number of speeches. Yet presidents also focussed on the economic situation and way of the recession – most prominently included in the messages of the presidents of Greece, Portugal and Iceland. The latter’s speech was however mostly reported on due to the fact that president Ólafur Ragnar Grímsson announced that he would not run for a sixth term as president. Overall, this once again highlights that presidential Christmas and New Year’s addresses can be important indicators of the political situation or the importance of particular events throughout the year. Until now, there has nevertheless been only very limited academic research on presidential statements on these occasions. So far, I could only find an analysis of the role of religion in new year’s addresses by Swiss Federal Presidents – showing an overall decline in biblical references throughout the years. In most European republics appear to follow this trend – explicit biblical references beyond a mere reference to the holiday can only be found in the speeches of the presidents of Malta and Hungary. From top left to bottom right: Presidents Higgins (Ireland), Duda (Poland), Wulff (Germany; 2011), Coleiro Preca (Malta), Iohannis (Romania). 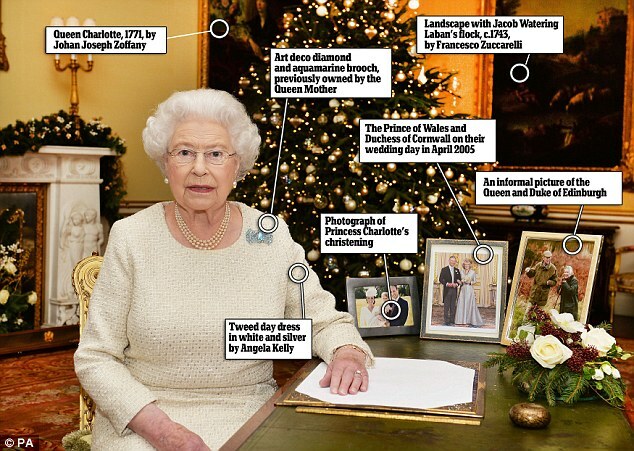 Last but not least (and partly inspired by the DailyMail’s analysis of the photographs on Queen Elizabeth II’s desk), I think it is worth looking at the setting of presidents’ speeches. Where speeches are broadcast on TV (or recorded and then put on youtube), the setting is surprisingly similar with the president usually sitting or standing in front of flags or a fireplace. In Germany, this set-up had so much become the norm that Christian Wulff’s walking speech among a group of surprisingly diverse citizens (see centre image of above collage) caused great excitement among editors trying to fill the seasonal news slump. More unusual however was Swiss Federal President Adolf Ogi’s address of 2000 – he stood in front of a railway tunnel (watch the video here). Kley, Andreas (2008). ‘”Und der Herrgott, Herr Bundespräsident?” Zivilreligion in den Neujahrsansprachen der schweizerischen Bundespräsidenten’. In: Kraus, Dieter et al. Schweizerisches Jahrbuch für Kirchenrecht. Bern, Switzerland, 11-56. A list with links to the 2015/2016 speeches can be downloaded here. This entry was posted in Bulgaria, Croatia, Cyprus, Czech Republic, Estonia, Europe, Finland, France, Germany, Greece, Hungary, Iceland, Ireland, Italy, Latvia, Lithuania, Malta, Poland, Portugal, Romania, Slovakia, Slovenia, Switzerland and tagged Christmas message, new year's address, presidential address, presidential speech, presidential speeches on January 4, 2016 by Philipp Köker.